, a distinguished botanist* was born at Newent, in the forest of Dean, Gloucestershire, Dec. 9, 1735. 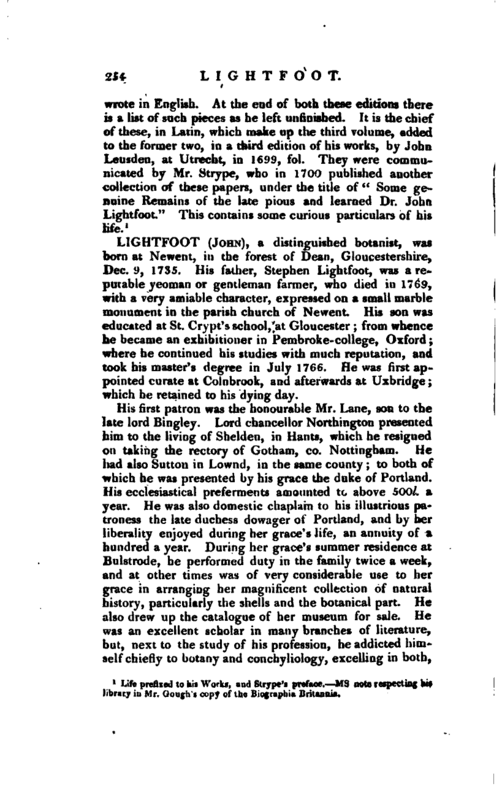 His father, Stephen Lightfoot, was a reputable yeoman or gentleman farmer, who died in 1769, with a very amiable character, expressed on a small marble monument in the parish church of Newent His son was educated at St. Crypt’s school,Jat Gloucester; from whence he became an exhibitioner in Pembroke-college, Oxford; where he continued his studies with much reputation, and took his master’s degree in July 1766. He was first appointed curate at Colnbrook, and afterwards at Uxbridgef which he retained to his dying day. His first patron was the honourable Mr. Lane, son to the late lord Bingley. Lord chancellor Northington presented him to the living of Shelden, in Hants, which he resigned on taking the rectory of Gotham, co. Nottingham. He had also Sutton in Lownd, in the same county; to both of which he was presented by his grace the duke of Portland. His ecclesiastical preferments amounted to above 500l. a year. He was also domestic chaplain to his illustrious patroness the late duchess dowager of Portland, and by her liberality enjoyed during her grace’s life, an annuity of a hundred a year. During her grace’s summer residence at Bulstrode, he performed duty in the family twice a week, and at other times was of very considerable use to her grace in arranging her magnificent collection of natural history, particularly the shells and the botanical part. He also drew up the catalogue of her museum for sale. He was an excellent scholar in many branches of literature, but, next to the study of his profession, he addicted himself chiefly to botany and conchy I iology, excelling in both, | but particularly in botany, and he was equally versed in the knowledge of foreign as of British botany. In 1772, the late Mr. Pennant invited Mr. Lightfoot to be the companion of his second tour to Scotland and the Hebrides, advising him to undertake the compilation, as he himself modestly calls it, of a “Flora Scotica,” which Mr. Pennant offered to publish at his own expence. 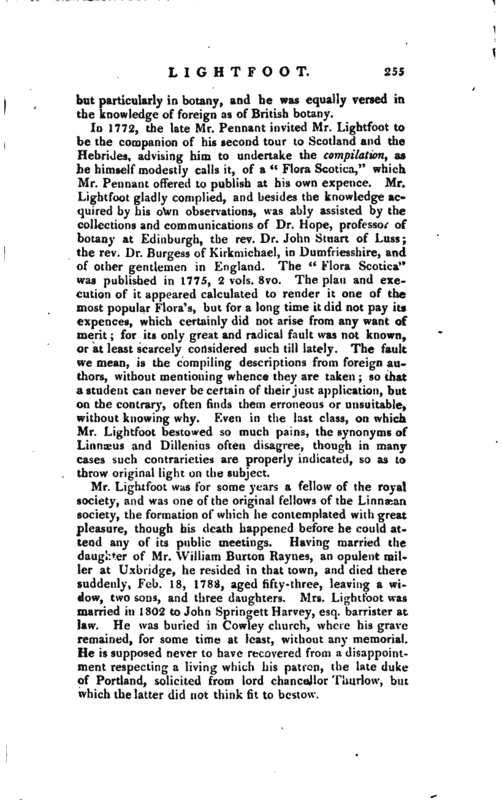 Mr. Lightfoot gladly complied, and besides the knowledge acquired by his own observations, was ably assisted by the collections and communications of Dr. Hope, professor of botany at Edinburgh, the rev. Dr. John Stuart of Luss; the rev. 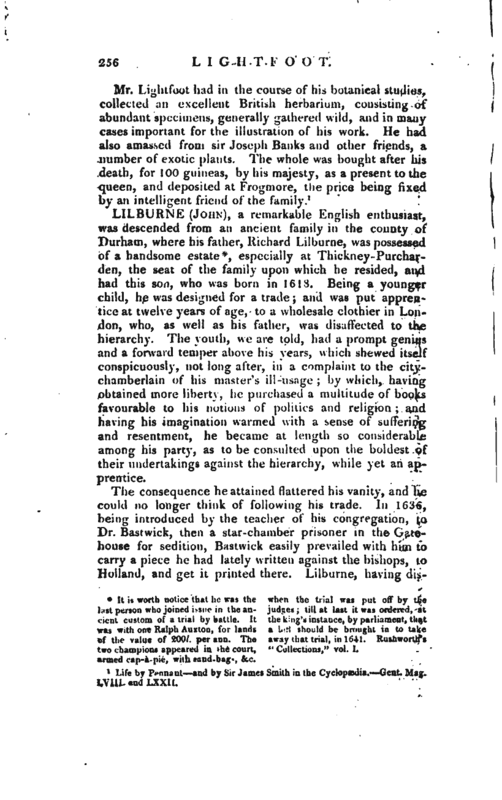 Dr. Burgess of Kirkmichael, in Dumfriesshire, and of other gentlemen in England. The “Flora Scotica” was published in 1775, 2 vols. 8vo. The plan and execution of it appeared calculated to render it one of the most popular Flora’s, but for a long time it did not pay its expences, which certainly did not arise from any want of merit; for its only great and radical fault was not known, or at least scarcely considered such till lately. The fault we mean, is the compiling descriptions from foreign authors, without mentioning whence they are taken; so that a student can never be certain of their just application, but on the contrary, often finds them erroneous or unsuitable* without knowing why. Even in the last class, on which Mr. Lightfoot bestowed so much pains, the synonyms of Linnæus and Dillenius often disagree, though in many cases such contrarieties are properly indicated, so as to throw original light on the subject. 1 Life by Pennant and by Sir James Smith in the CyclopxJia. —Gent Mag. LVIII. and LXXII.